Horror-comedies are a bit of a guilty pleasure of mine. From Tobe Hooper's The Texas Chainsaw Massacre 2 to Return of the Living Dead to Zombieland, I can say I've seen my fair share. I find myself returning to the genre time and again to see if I can find that special gem meant for depraved souls like mine who can laugh and cringe at the same time. Of course, the bloodier the better. I know a lot of people are going to say that I waited forever to watch this movie and I will not argue that point. If there is ever a movie that seemed like it was made for me then this one definitely fits into that category. For one, I love my fair share of hillbilly horror. From Edward Lee novels to the classic movies like The Hills Have Eyes and the original The Texas Chainsaw Massacre, I admit I have a softspot for the hillbilly horror genre. I admit I've even seen Motel Hell multiple times. 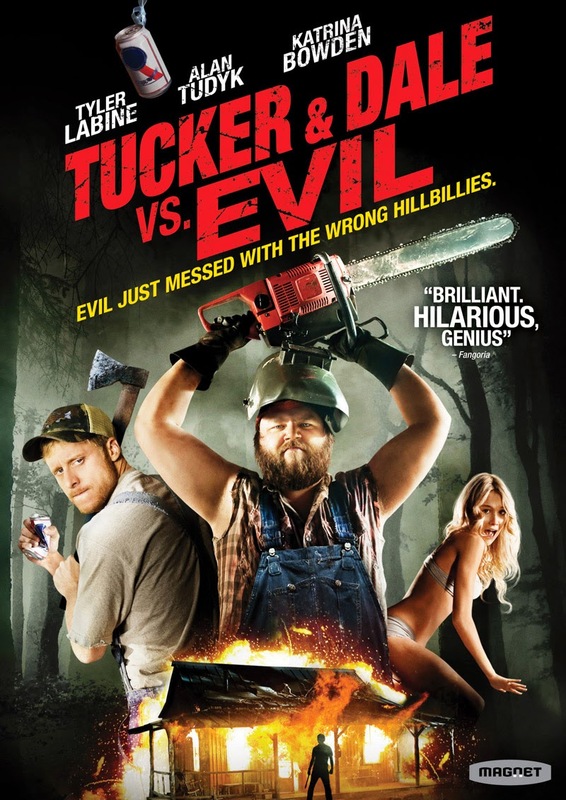 But Tucker & Dale vs Evil has become mandatory viewing for me now in ways that many others haven't. It just took one viewing, but that was all I needed. This film takes the concept of the the killer hillbillies and turns it on its head by turning it into the killer college kids attacking the harmless hillbillies. Of course, the college kids only end up killing themselves and the hillbillies wonder just how they've managed to end up in the middle of a mass suicide of college kids when all the hillbillies did was rescue one of their friends from drowning. It's a fairly simple premise, but it is a genius one and the movie rides it in style. Mistaken identity taken just about as far as it can go and done with spectacular results. This movie is hilarious. My sides were hurting because I was laughing so much. That's a phrase I don't just throw around, either. Highly recommended to those five people left on the planet that haven't seen this yet. The wood chipper scene is a favorite of mine. I'd have to agree with you there. I love it when he tries explaining to the cop. "Officer, we've had a doozy of a day."